While lilies are considered to be in season during the spring and summer months, these flowers look gorgeous any time. In selecting the perfect flower, you need to understand what these flowers mean and where they come from. There are simply a few things you need to know about these flowers. First, you should know that lilies are extremely fragrant. On top of these high stems sit trumpet-like blooms that are a glory to behold. In bold colors, these flowers speak volumes. This guide will provide you with everything you need to know about lilies. The lily has more than 100 genuses in its family, which is huge. The lily also has deep roots, possibly back to the 1500s BCE. In fact, lilies have also been mentioned in religious texts, including the Bible. The Easter lily is still a common flower today and originated in Japan. It was actually during World War I that these flowers spread around the world. If you attend church during the spring months, you are bound to come across Easter lilies adorning the aisles. You might also be interested to know that the Easter lily is symbolic of strong fertility. Egyptians used lilies in their makeup and scents, creating fresh oils. This is a tradition we embrace today, as the lily still offers its fragrance. There is no substitute for the sweet scent of the lily. According to an old Greek story, the lily sprang from the breast milk of Hera, the wife of Greek god Zeus. Another addition to the story states that the pistil in the middle of the lily comes from the jealousy of a Roman goddess, Venus. She was upset that the lily was so beautiful that she wanted to add something to it that would make it unappealing. Unfortunately for her, it did not work. These flowers became extremely popular during the Victorian era when people would wear gorgeous lilies in their hair or on their clothing. If you look at Victorian-era photos, you might even see lilies as part of some of the poses. Today, the lily is still a popular flower. In fact, you will find bouquets with these gorgeous blossoms throughout the spring and summer seasons stocking the shelves of stores. The lily’s meaning has evolved over time based on location and era. Just like any other flower, the lily has different meanings associated based on when and where it is given. Use context clues to assess the meaning of a flower in addition to tradition. During the Victorian age, the lily signified “majesty.” They were associated with the Virgin Mary as well, representing the most pure of all those considered to be important figures. The way the lilies are used to decorate churches and other religious centers demonstrates this. Color also accounts for some of the flower meanings. For example, pink lilies are symbolic of wealth and good fortune. Orange lilies are representative of passionate emotions, generally positive. Yellow and gold lilies, which pair well with orange, represent good health and healing. They are great for wellness bouquets and wishes for recovery. The bright red lily is a common present, but it is also romantic and passionate. These flowers are often used as part of weddings and proposals. The stargazer lily is one of the most popular flowers out there today. These blooms represent ambition and success. They can also provide encouragement to somebody who needs it. White lilies are perhaps among the most popular of the lilies. These flowers are symbolic of virtue and innocence. The purity of the color and style of blooms can not understated. In fact, it is normal in some cultures for the bride to wear white lilies as a crown when she walks down the aisle. The lily of the valley is a sweet and simple flower. The small flowers are delicate and graceful, with the blooms symbolizing purity of heart and a sweet nature. The tiger lily is closely associated with Buddhism. This bloom is a representation of mercy, and it also offers a sense of compassion. Send these flowers to somebody who is going through a difficult endeavor. In the past, lilies have also been a symbol of death. They were once used to grace the graves of children who had passed away. Due to ancient Greek mythology, lilies are commonly associated with motherhood and childbirth. This means that it is common to give these flowers to a mother or mother figure on Mother’s Day or a similar holiday. Lilies are also commonly used in weddings, as is common in China. Lilies are associated with good fortune and luck. They are also meant to be a guarantor of true love. If you want to give somebody a flower for an anniversary, the lily is perfect for the 30th anniversary. When given in this context, the lily is a symbol of devotion. Growing lilies in your yard is not extremely difficult because the flowers are pretty hearty. Keeping them pert in a glass vase, on the other hand, is a bit more difficult. Always keep lilies away from your cats. These blooms, as beautiful as they are, can cause a number of health issues in felines, including kidney failure and possibly even death. When you put flowers in a vase, remove the leaves so that they aren’t hanging into the water. Additionally, trim the stems about one or two inches to allow water and nutrients to reach the flower.Make sure to use a diagonal cut rather than a horizontal one. Use distilled water in your vase for best results. The goal is to remove traces of chlorine and other chemicals that are often found in tap water. These may have a negative influence on the perkiness of the flowers. Place lilies away from potential temperature issues. This means they should not be in direct sunlight or in an area that may get too drafty or humid. Avoid handling lilies whenever possible. This may detract from their lifespan because lilies tend to bruise easily. You don’t want your blooms to be discolored! Remove the anthers when possible. Otherwise, the yellow pollen may brush off the flower and end up on your clothing. This pollen easily causes stains on clothes and carpets. Change the water in your vase every two to three days. If you see the water become cloudy before three days, it is acceptable to change it earlier. Use a life extender packet of nutrients to supply your beautiful lilies with the extra help they need to perk back up. Daylilies and water lilies are actually not considered to be true lilies. Do you intend to plant some lilies? Plant the bulbs in the fall. They will be dormant for a while but emerge renewed in the spring. In the past, the roots of lilies were used for medicinal purposes. When boiled as part of a tea, they were even meant to ease stomach issues. Oil obtained from the lily has softening properties. If you have dry or cracked skin, you can use the oil to achieve that dainty feeling you’ve been missing. Lilies are perennials, and they can last up to two years. Insects and rodents find the bulb of the lily to be a delicious feast. They’re not the only ones. In some regions, some people will also eat certain types of lily bulbs. Many are actually quite edible. Some species of lilies can grow up higher than five feet tall based on conditions in which they are grown. While roses are still among the most popular flowers in the world, the lily has its own special place in the world of flowers. The lily offers different symbolism and meaning based on gorgeous colors, and it is also a great alternative to the rose because it is more casual. The lily also offers something that can’t be found in a rose. Lilies are unique, offering a different sense of flair. When you are looking for a gift that is unlike any other bouquet you have sent in the past, a lily assortment will stand out. Your gift is one that will be remembered for years to come. 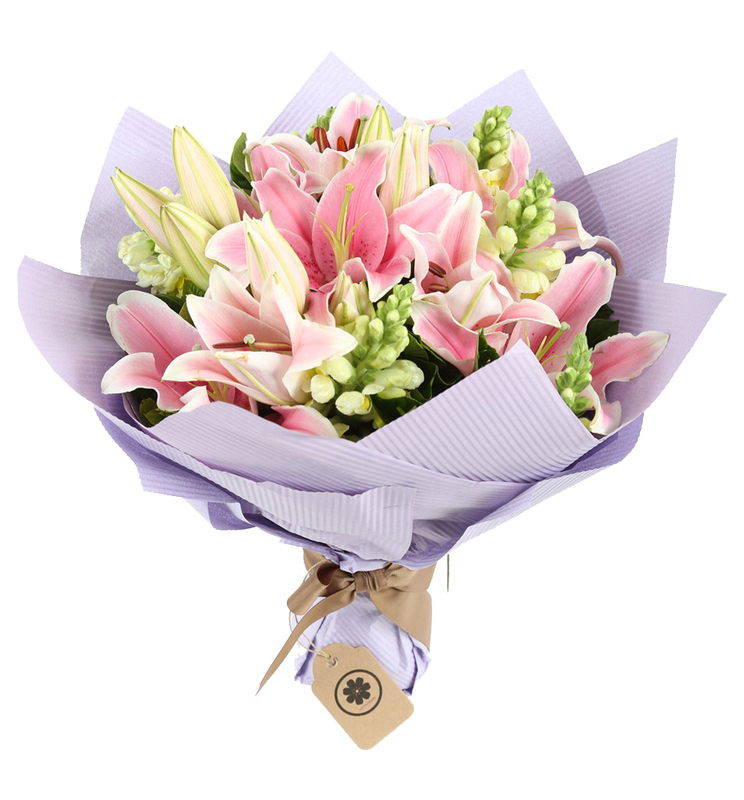 The Elegant Lilies Flower Bouquet is just as graceful as the name implies. This meaningful gift arrives in a beautiful arrangement of white blooms. The lilies rest on a bed of eustoma and seasonal foliage to really stand out in the crowd. This is the ideal romantic gift for a holiday, anniversary, or birthday. We also recommend the Mixed Lilies Bouquet, which is stunning even beyond first sight. Mixed lilies are classic, offering a fantastic shade of pink next to other fresh foliage. This is a purely elegant gift without overstating its meaning. It represents class and grace, making it the perfect birthday or new baby gift. The lily lover in your life will also adore the Gerberas, Lilies & Eustoma Bouquet. This arrangement is bright and bold, still offering elegant lilies. This bouquet is the perfect choice for a lovely occasion like Mother’s Day or an anniversary. Finally, we suggest giving the Pink Roses & White Lilies in Vase gift. This lovely assortment contains gorgeous colors next to each other. The long-stemmed roses look fantastic next to the bright white lilies. No matter what kind of lilies you choose, your loved one is going to be thrilled with them. Lilies are fabulous choices, and there is a color or style for any occasion. You simply can’t go wrong in sending lilies for a special occasion or gift.